Well?? Did you find him??? Where is the blurry out-of-focus photo as proof? I so hope you haven’t been eaten by Bigfoot. I’m not easily digestible. 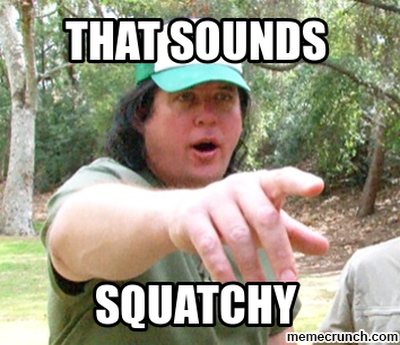 Besides, Bigfoot only eats berries, grubs, and Buffalo wings. 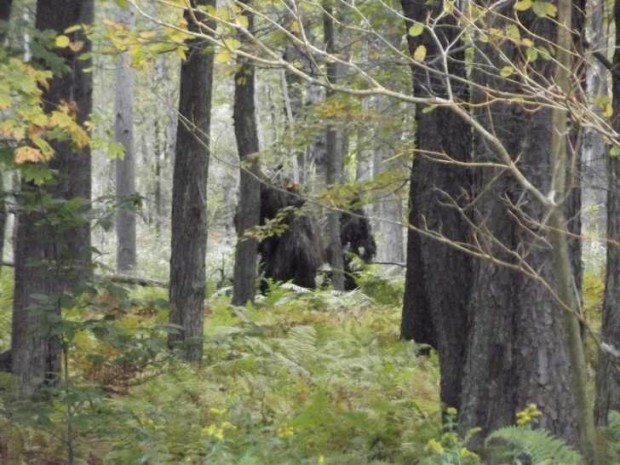 We’ve have perfect Squatch watching grounds here, my camera doesn’t take clear photo’s, only blurred…(see my blog), I have camouflage pants and underwear..see my blog…and I believe I am known to be cynical…. (you have 2 women wanting to Squatch watch with you who are contemptuously distrustful of human nature and motives ) maybe just us women should go?? ?I think we’ll hire Bubba…. I’ve done more for less. 2. Although rural Pennsylvania is a likely bigfoot habitat, you’ll probably have more luck in West Virginia. I think we’ve spotted a couple while driving through, but we are not sure. Do they drink beer and wear overalls with missing buttons? If they do, then that’s them! Bigfoot is notorious for loosing buttons. Aha, I was right, those were bigFEET! If you fail to locate the Bigfoot in rural Pennsylvania, you could venture out to Manhattan, DC, or Palm Beach to try to catch a glimpse of a red-headed smallhand. This may be the first time I’ve ever been qualified for any job title that included the word “reasonable.” So, is there a form to fill out, or do you just need a recording of me saying skeptical things while subtly encouraging you to bathe? No need to be subtle.